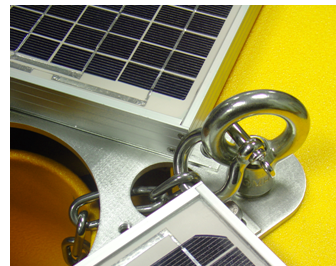 MB-300/MB-400 Safe Deployment - NexSens Technology Inc.
Connect the buoy attachment chain to the top of the mooring line using the 3/8” bow shackle. The opposite end of the chain will be connected to a top side mooring eye. Connect the heavy chain to the bottom of the sensor mooring line using 1/2” bow shackle. 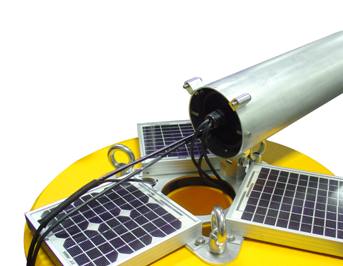 With the SDL500 data logger and sensors laid out on a flat surface, secure to the sensor mooring line using sensor clamps and plastic cable ties. 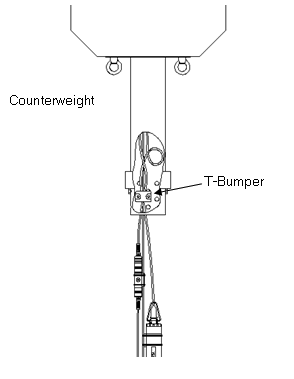 To prevent cable chafing, it is recommended that a cable bumper (T-Bumper) be used to separate the sensor cable from the sides of the counterweight. Position the bumper so that it will fit just inside the bottom of the counterweight (see drawing below). With the SDL500 data logger and sensors properly attached to the sensor mooring line, the system is now ready to be lifted onto the work boat for deployment. Coil the sensor mooring assembly for convenient transport. Connect a short stainless steel line to the marker buoy using a 5/8” shackle with screw pin through the thimble (see below). Attach a 1/2” shackle to the opposite end of the line. 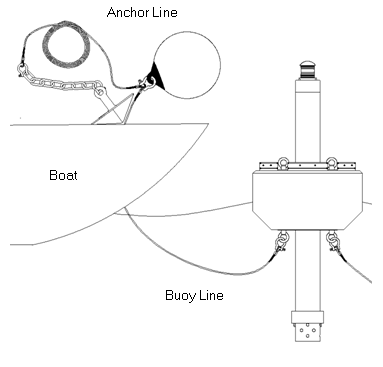 Connect the anchor, bottom chain and water column line using one 1/2″ shackle and one 5/8″ shackle. 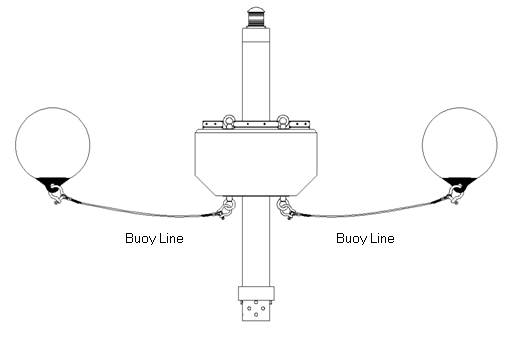 Before deployment, attach the buoy lines to two of the bottom side mooring eyes. DO NOT attach anchors, chain, and long mooring lines. Place the buoy in the water and allow the two marker buoy lines to follow. The data buoy and two marker buoys are now floating clear of the boat. 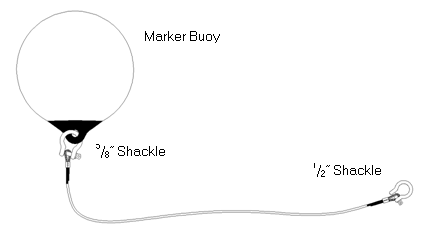 Attach the closest marker buoy to the anchor line. With the data buoy floating in the desired location, move the boat while paying out most of the anchor line and chain. Drop the first anchor. Move the boat to the opposite side, and attach the second marker buoy to the anchor line. Move the boat while paying out most of the anchor line and chain. Drop the second anchor. This completes the two-point mooring. Open the tower to a horizontal position by unscrewing the tie-down bolts. Remove the stop bolts shown and slide the SDL500 into position. 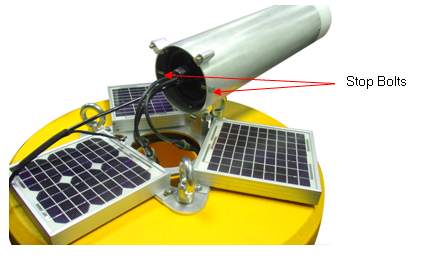 Then replace the stop bolts and reconnect the three MS4 connectors to the solar power pack cables. Position the connectors outside of the buoy well as shown. Lower the sensor mooring through the center buoy well and connect the buoy attachment chain to a top side mooring eye. Return the tower to the vertical position and secure the tie down bolts.